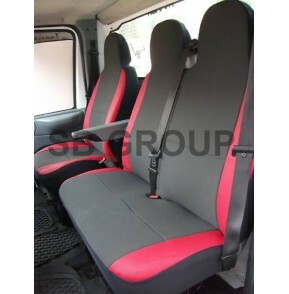 Ford Transit Van Seat Covers- 1 Drivers Single and 1 Passenger Double. Our latest innovation in van seat covers which have been specially engineered in this high back design to enhance the looks, add comfort and most importantly give complete protection to your van seats. 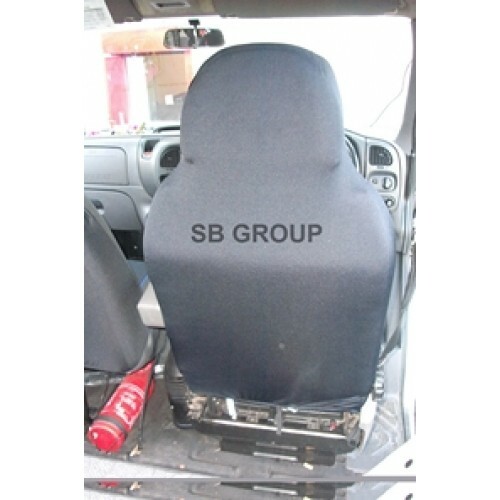 Our fundamental goal is to preserve your Ford Transit Van seats and in our experience we are well aware of the amount of abuse and damage that is inflicted on your van seats, and therefore, here at SB seat covers we always use the best quality fabric. Colour: - Centre fabric is dark anthracite colour with side panels in smart red leatherette (man made leather) trims which gives it a very elegant look. Kindly tell us about the number of arm rest/s opening/s (none, one or two) you will require, if any, and we will accordingly leave the opening/s for the arm rest/s to come through. 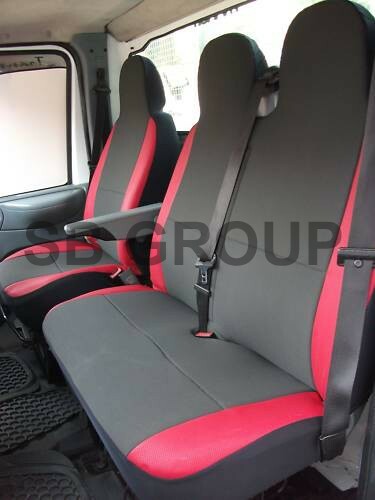 These Ford Transit Van Seat Covers are made with the best quality OEM(Original Equipment Manufacturer) cloth seating fabric. Multiple layers of fabric make up this seating cloth. Centre fabric is polyester/ cotton mixture, which is dark anthracite colour. This is light tested, rub tested and confirms to all OEM seating standards. Scrim/ Lining made of cotton, this stops the seat covers from sliding. Foam lining which is a British Standard, which makes it ever so comfortable to sit on. 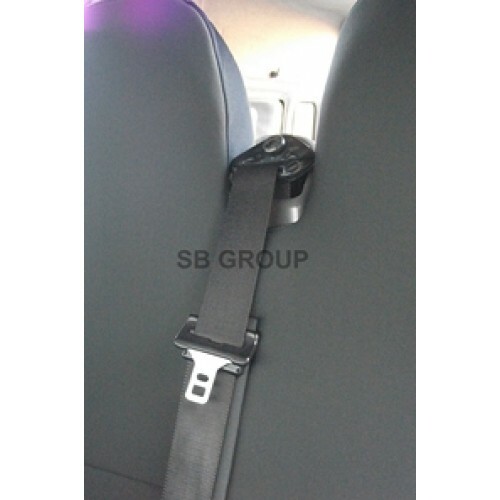 Both the seat covers are backed with stretch polyester fabric which goes right down the back of the chairs which ensures complete protection for your seats. Side panels are in man made leatherette and the advantage is that it takes more wear and tear as compared to the soft leather. Kindly note that this double passenger seat cover is in one piece. 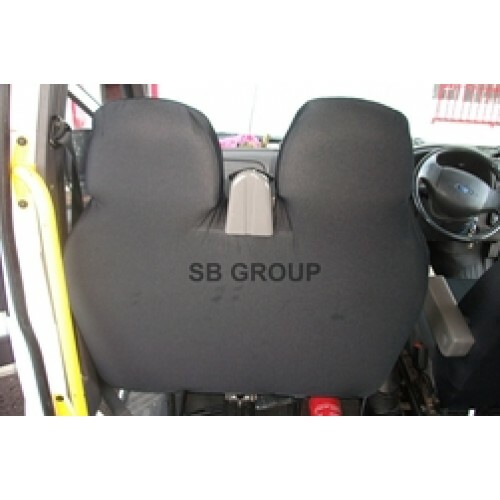 If you need we can modify the double passenger seat cover into one top section and one bottom section- which will be slightly dearer. Please call us or write to us.